(CNS): A new free diving record was set in the Cayman Islands by Steve Benson from the United States earlier this month when he held his breath for seven minutes, 43 seconds in the free-diving discipline of static apnea during an international competition. Static apnea challenges breath-hold divers to float face down in the water for as long as possible under the supervision of safety divers and official judges. 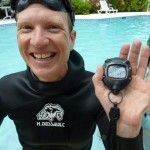 A physician’s assistant at Eastern Urological Associates, Benson surpassed the static apnea record of 7:39, set by Hawaii’s Bill Graham in July 2009. After seven minutes underwater, Benson’s coach began to call out the time signals every 15 seconds. After surpassing the record by four seconds, Benson surfaced with some heavy breathing and quickly demonstrated that he had full control of his mind and body by completing a protocol that included telling the judges he was OK.